But if you are comfortable with imported/grey-market that come with a 1-year warranty from the seller (not Sony USA), then to the eBay Deals we go where eBay seller “Department Store NYC” is offering it in imported grey-market condition for $2700 with free shipping and a 1-year seller warranty from Dept Store NYC (not Sony). Up to three per customer at the sale price. IF you are eligible for the limited time eBay Bucks bonus promotion, you can get $100 eBay Bucks on the purchase. The promotion has limits, so you don’t get unlimited 8%. Sunday can mean new instant savings promotions as Sunday is the beginning of a new “retail” week/month/etc. 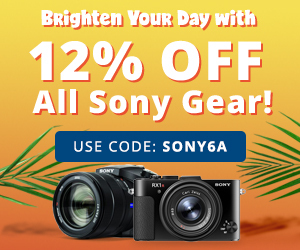 Sony has launched a new round of instant savings promotion on a variety of their gear, which you can find nicely organized at B&H Photo. Among the items on sale are a trio of their full frame cameras: the a9 for $4200, the a7r II for $2000 and the a7s II for $2200. PS: check on the individual listing of each camera for optional offers that include free accessories with purchase! The silver lining good news of today’s update of the Stock Status Tracker is that the Amazon estimates for both the sony a7 III body only and the a7 III w/28-70 have “improved” from “1 to 2 months” to “2 to 5 weeks”. This is still a nebulous estimate, so keep that in mind if you need the camera by a specific date. The new condition Sony a6000 body only APS-C mirrorless camera goes for $500 at authorized Sony USA dealers such as Adorama but if you are comfortable with used, you can get it in “Used – Like New” condition for $369~ at Amazon Warehouse Deals (AWD) thanks to a 20% off in-cart discount. This link shows other sellers as well for comparison. The automatic in-cart discount only works when the seller is “Amazon Warehouse Deals” itself, and not 3rd-party sellers. The previous link shows only the Warehouse Deals itself offer participating in the previously mentioned earlier today 20% off Earth Week promotion. With the release of the new Sony a7r III, the a7r II body only dropped in price, currently going for $2400 [see 35mm Full Frame Price Charts], but that’s not all, Adorama is bundling it with a FREE Flashpoint Zoom Li-on R2 TTL On-Camera Flash Speedlight for Sony, together going for the same authorized dealer price of $2400 with free expedited shipping. This too is part of their WPPI specials.